Throughout its history, popular mass-mediated culture has turned its attention to representing and interrogating organizational life. As early as Charlie Chaplin’s cinematic classic Modern Times and as recently as the primetime television hit The Simpsons, we see cultural products that engage reflexively in coming to terms with the meaning of work, technology and workplace relations. 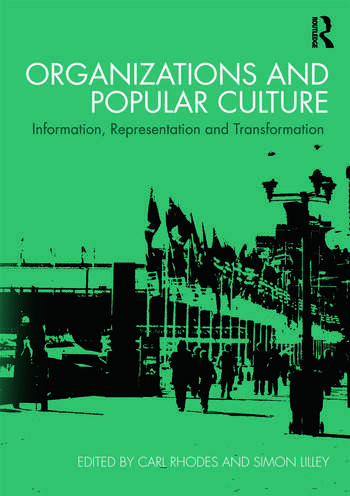 It is only since the late 1990s, however, that those who research management and organizations have come to collectively dwell on the relationship between organizations and popular culture – a relationship where the cultural meanings of work are articulated in popular culture, and where popular culture challenges taken for granted knowledge about the structure and practice work. Key to this development has been the journal Culture and Organization – a journal that has been centre stage in creating new vistas through which the ‘cultural studies of organization’ can be explored. This book brings together the journal’s best contributions which specifically address how popular culture represents, informs and potentially transforms organizational practice. Featuring contributors from the UK, USA, Europe and Australia, this exciting anthology provides a comprehensive review of research in organization and popular culture. Carl Rhodes is Professor of Organization Studies at Swansea University, UK. His research interests focus on ethics and politics in organizations, organizations in popular culture, and theory and method in organization studies. He is currently senior editor of the journal Organization Studies and Associate Editor of the journal Organization. Previous publications include Bits of Organization (2009, with Alison Pullen), Critical Representations of Work and Organizations in Popular Culture (2008, with Robert Westwood) and Humour, Work and Organization (2007, co-edited with Robert Westwood), and many journal articles. Simon Lilley is Professor of Information and Organization, and Head of the School of Management at the University of Leicester, UK. He is editor of the journal Culture and Organization. His research interests focus on the relationships between (human) agency, technology and performance. Previous publications include Management and Organization: A Critical Text, 2nd Edition (2009, with Stephen Linstead and Liz Fulop), and numerous journal articles.